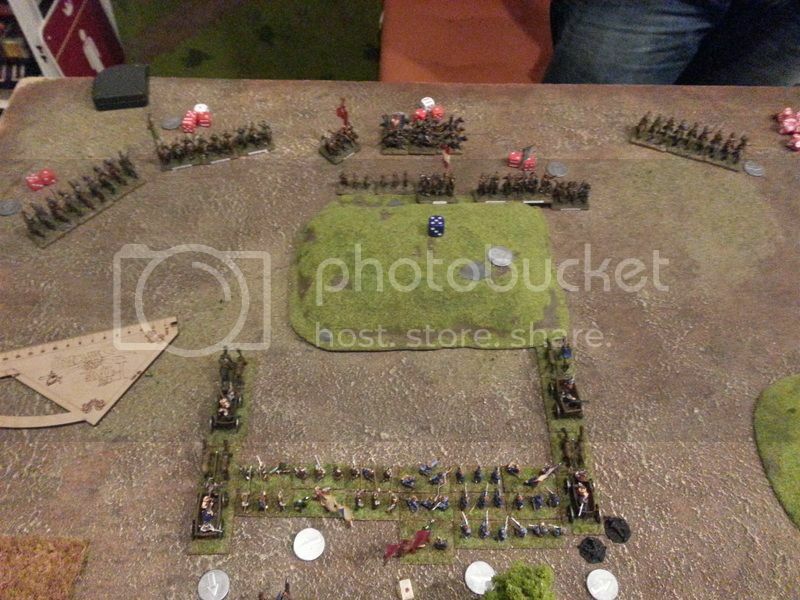 Here is a few pictures from the game I played with Juha this evening. We both had 10FSP lists, so we ended up playing Delay the Enemy scenario with My Muscovites defending. 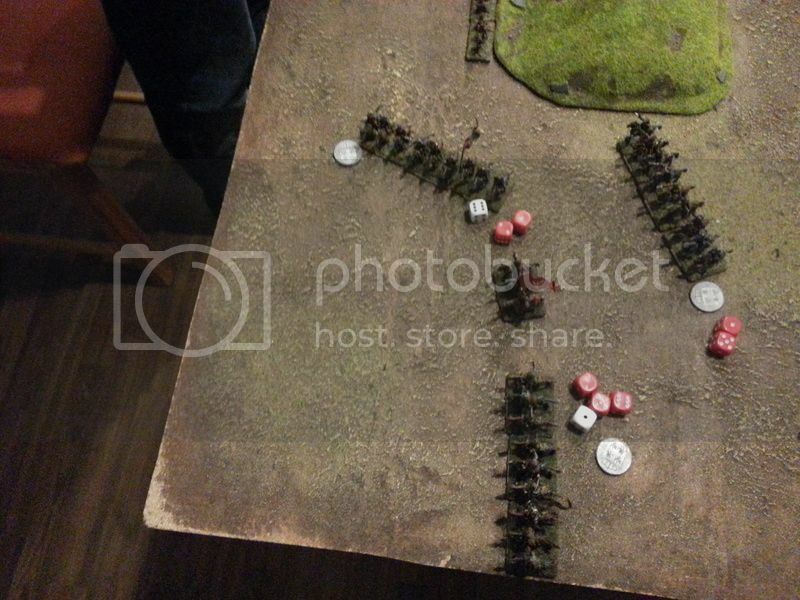 Juha played with a Lithuanian skirmish force. 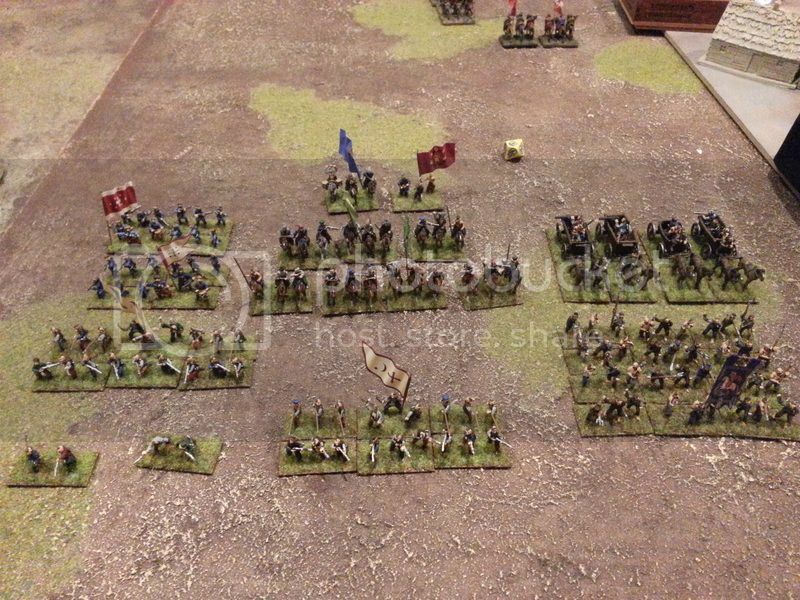 Here's a picture of deployment with initial moves and plans. 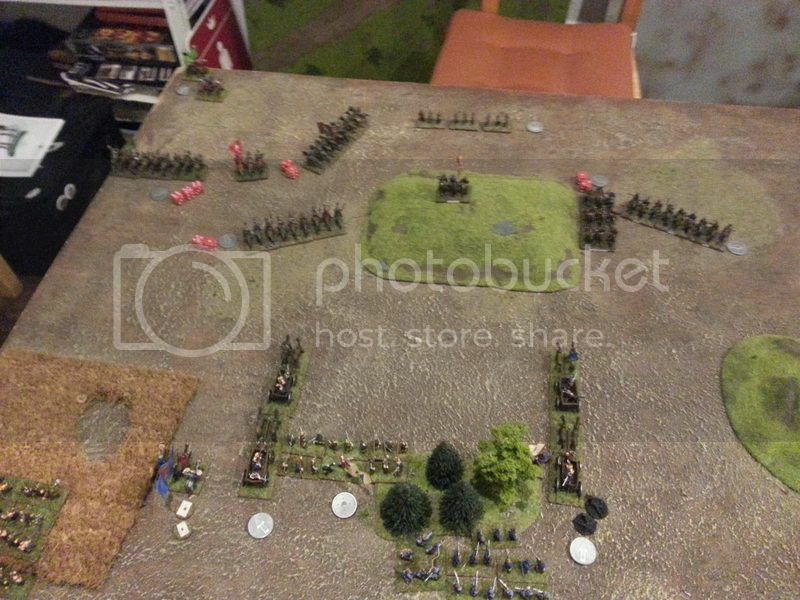 We ended exchanging shot in the left flank in the first turn. 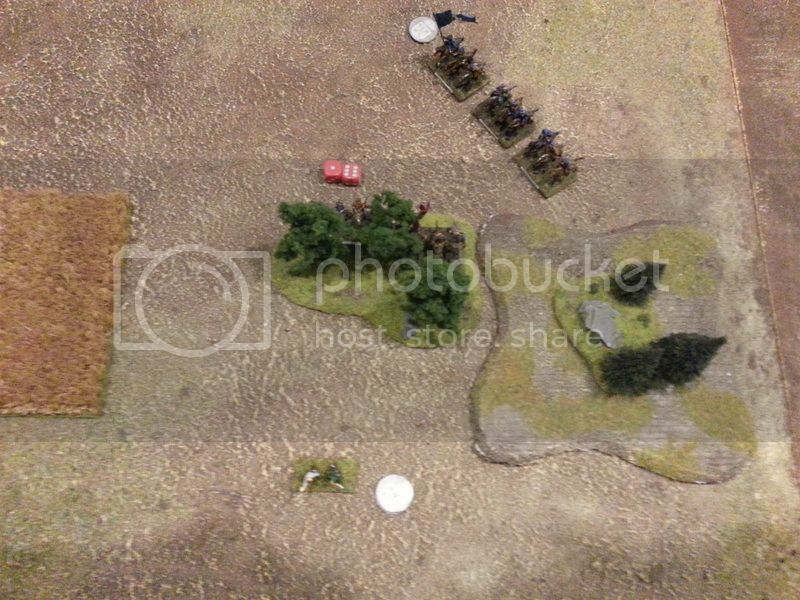 In fact the shooting contest lasted till round 4 with me taking heavy casualties from the dragoons. 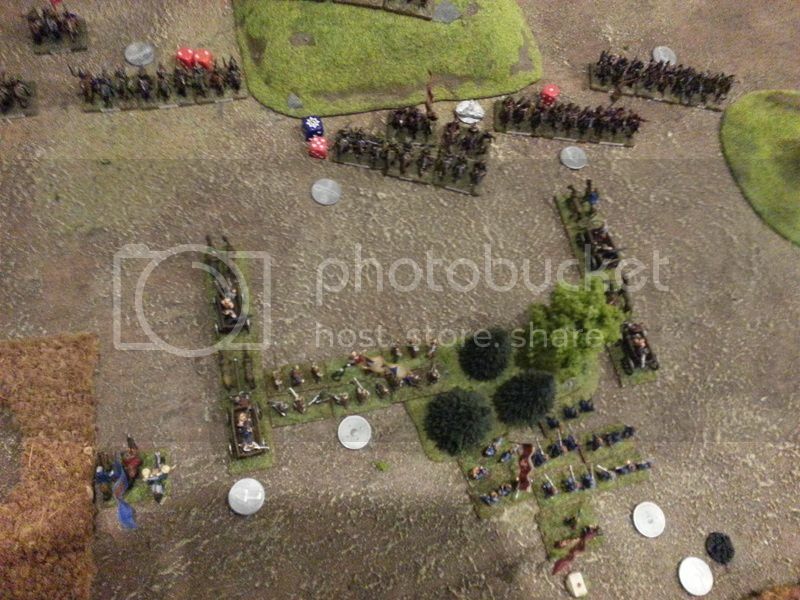 On 4th turn My boyar sons came to help the provincial soldats and drove the dragoons away with their fire. Meanwhile my streltsy had absolutely nothing to do or shoot. They were quite happy about it. The boatmen stood still at the edge of the woods and the delayed orthodox peasants arrived. 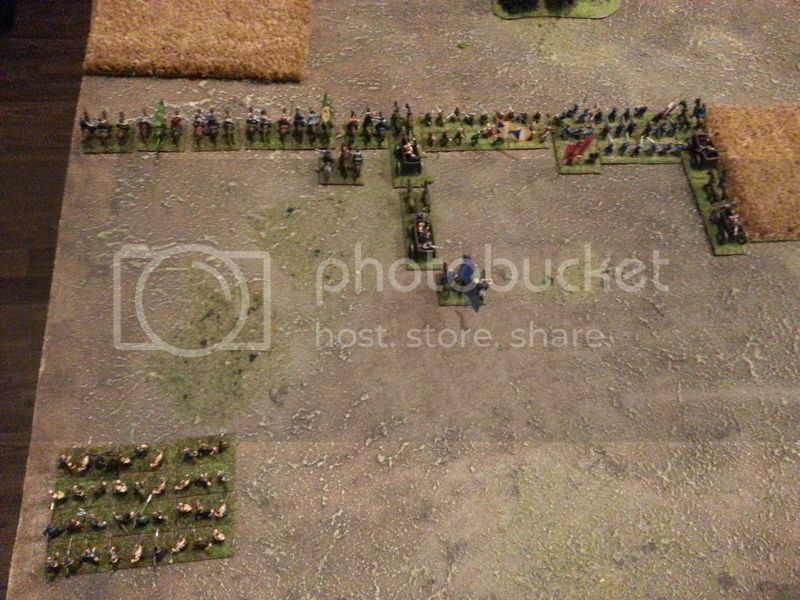 On turn two the peasants on the left flank were charged by cossacks and voluteers. They were swiftly beaten and the lucky surviving base was fleeing as fast it could towards the woods. On the third turn my dvorians counterattacked the cossacks that were running trough my peasant rabble .. err I mean my first line of defense. The dvorians got help from the boatmen hiding in the woods. 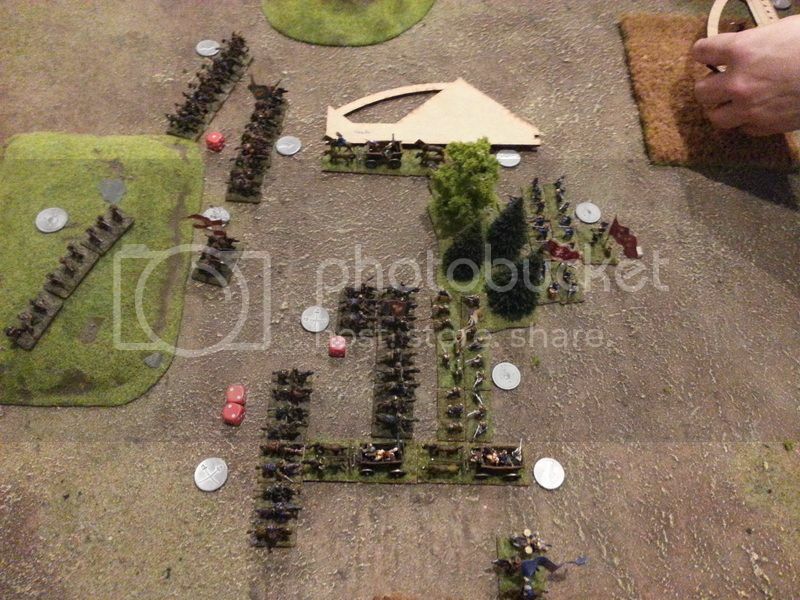 Their fire drove the attacking cossacks away in disorganization. The disorganized cossack were easy prey for my noble dvorians. The dvorians charged through remaining volunteers, who disorganized, while fleeing, the reiters that just had emerged in the flank. 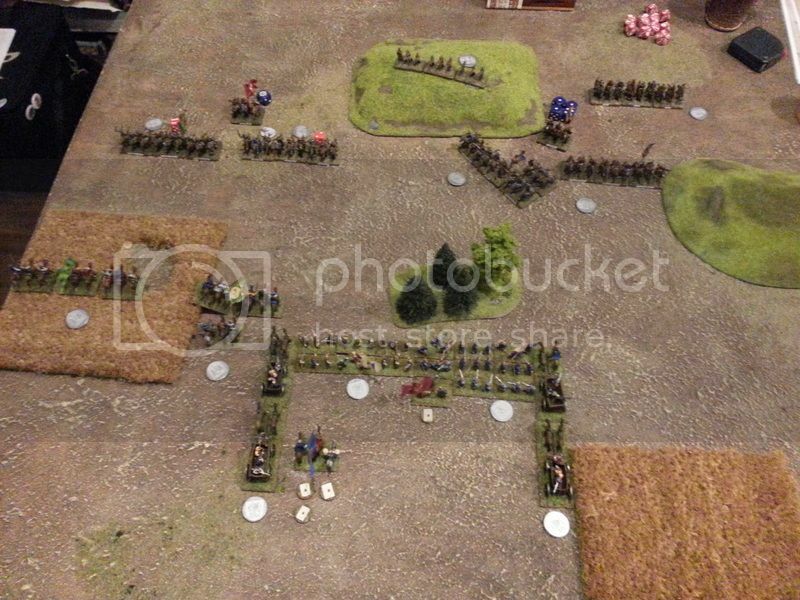 The boyar sons drove the dragoons away with fire and a few charge moves. 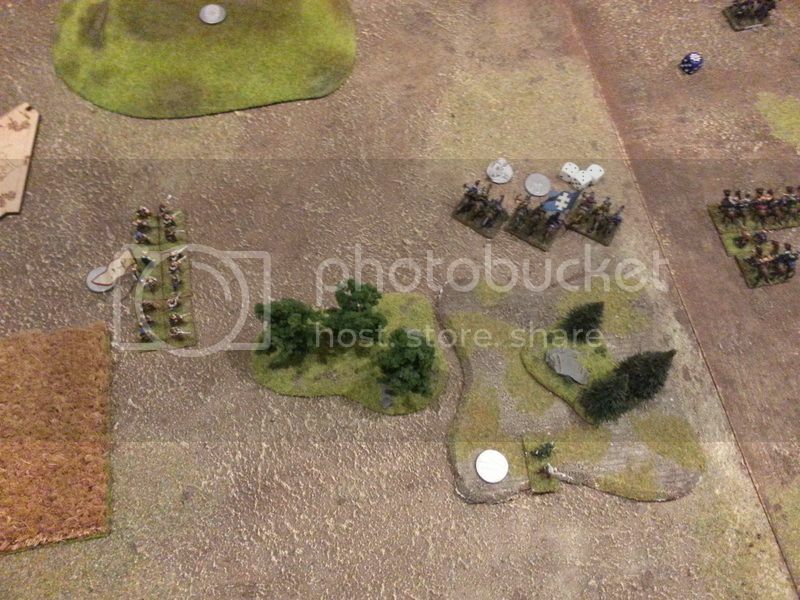 By the fifth turn the left flank looked like this. 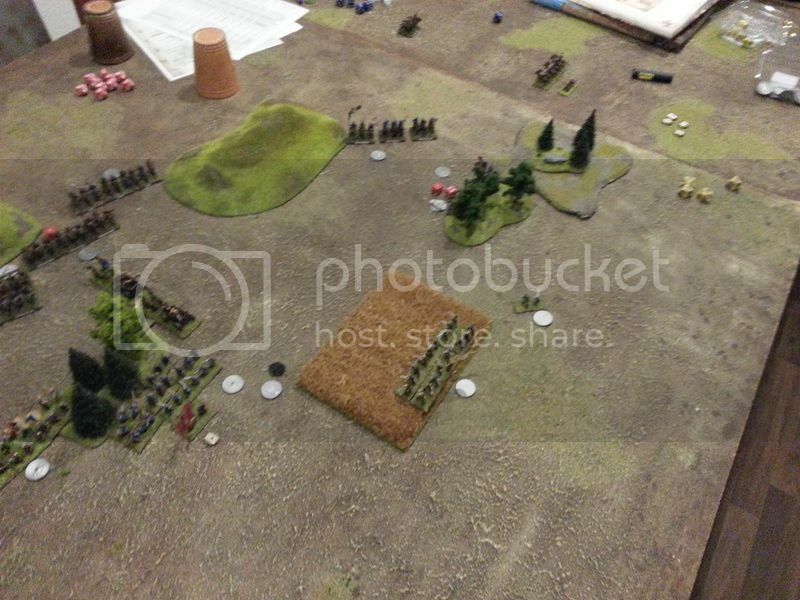 Nothing happened in the right flank. Two bases of tatars got trough my defenses and the last turn was just for cleaning the table. 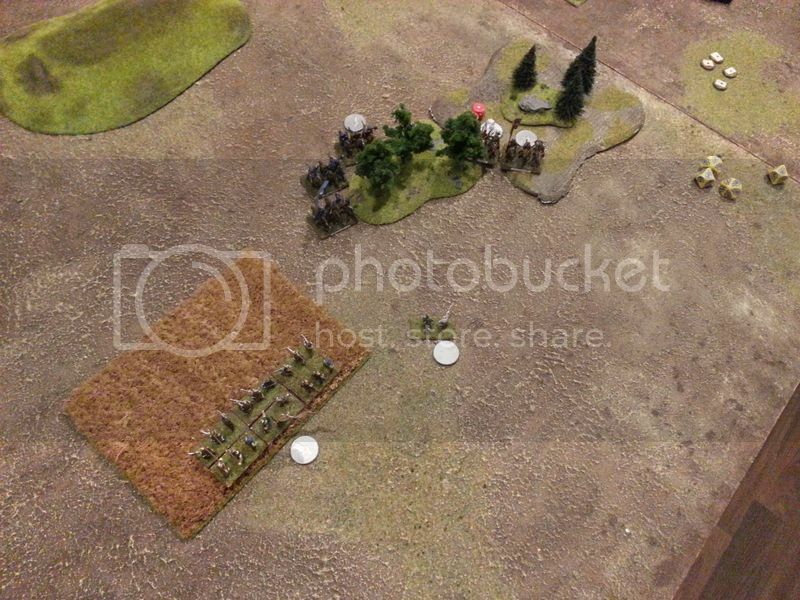 The delayed robbers (3 bases of volunteers) made a last daring attempt to take the central hill, but my soldats hold the line despite casualties. It was a 5-1 victory for the Muscovites. Juha has already posted his AAR, but still I'd like to share mine. My force strenght was 32 and reconnaissance value was only 8. Juha won the reconnaissance by 8 and chose splitting as the effect. The scenario was defend the crossing. And to Juha´s horror he was the attacker. The Finns had been too slow to react to Muscovite aggression and ended up attacking the bridge they were supposed to defend. It took too long for the Finns to muster the troops. I deployed my troops first and decided to hold the bridge at any cost. The right men for the job were the streltsy. With all the other troops on the other side of the river or on the river, the unthankful duty of guarding the flank of streltsy went to peasants, who had volunteered to help the noble Muscovites in theur fight against Lutherian oppression. The poor bastards new little of what the Golova had tasked them to do. More ill news were coming. Dimitry from the boyar sons had run in to an argument about his garlic breath with Sergey from the same squadron. The squadron witch Golova Krupin had organized by himself and tasked counter charge the Finns, if they somehow could penetrate defences on the other side of the bridge. One of his messenger rode from the nobles to inform that Dimitry was forced to leave the squadron and that he had taken his men with him. So the squadron was splitted into two groups. The Golova's hands were shaking as he opened his canteen for a little drop of vodka to ease his nerves. Golova Alexei Krupin was indeed the man in charge and despite the bad news to prove his complete supremancy of the field, he stood in the middle of the bridge surveying the closing Finns. He took a long sip from his canteen and cursed. It would be a long day and the vodka was almost gone already. There never was enough vodka. Not here in Finland. There was only swamps and forests and mosquitoes. Finland was a disgusting place. In the first turn the Finnish musketeers started their long countermarch towards the line of streltsy. The swedes didn't hit a thing and were out of range from the inferior muscovite handguns. 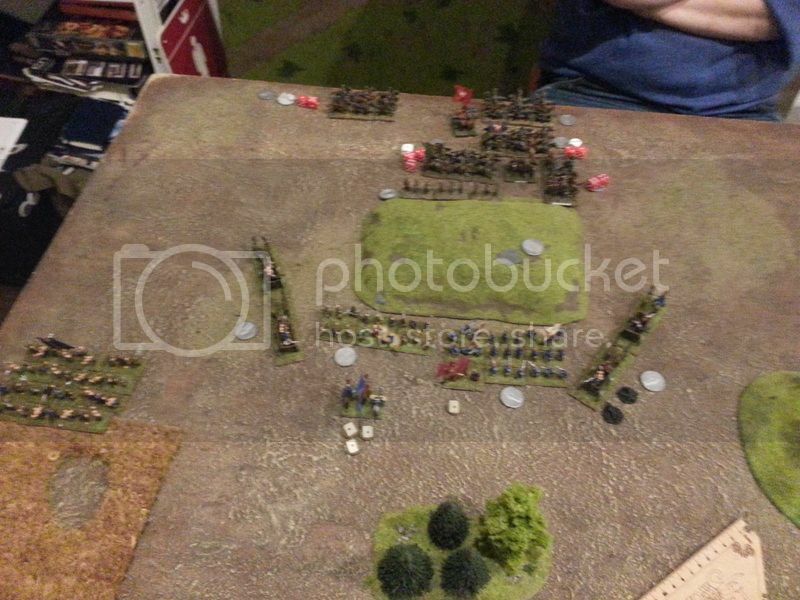 So the stretsy stood still and delayed their fire, for there was a sound of trampling hooves and pistol fire, with the cries of peasants being killed, in the right flank. After the surviving peasants had run trough their line, the streltsy opened fire at reiters from close range. A base was killed so was the reiters will to do more charging and they withdrew in disorganization. Golova Kurpin stroked his elegant and formidable beard smiling. Everything was going as planned. Now if the boatmen, tasked to surprise the Finnish rabble, arrived in time, then there might be enough vodka. 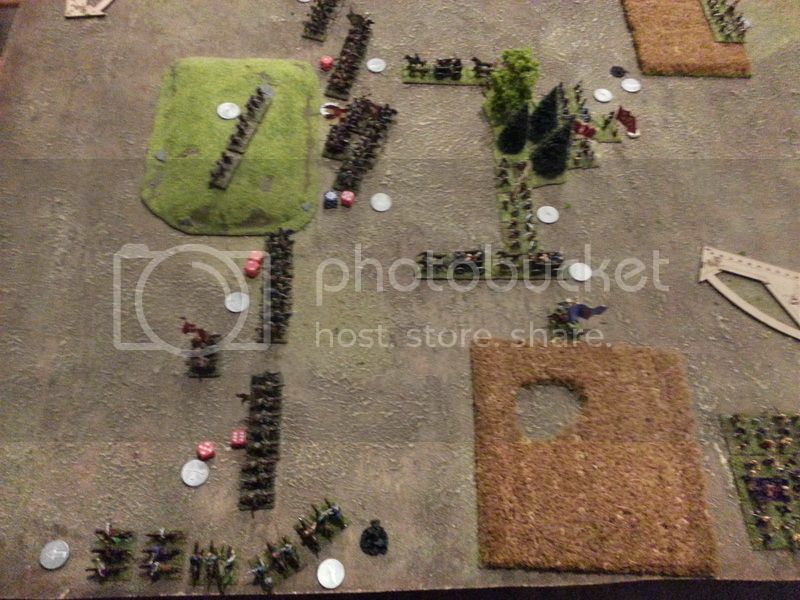 On the second turn the streltsy were in trouble. The Finnish musketeers countermarched closer shooting as fast as they could. Luckily their aim wasn't true. Al the managed to do was a lot of noise and smoke. Still with the peasants hiding behind their backs, the streltsy had to make a hasty reform to counter the charging Finnish adelsfana. Seeing the professional maneuver of the streltsy, the Finns had a second thought about their charge, and withdrew disorganized. 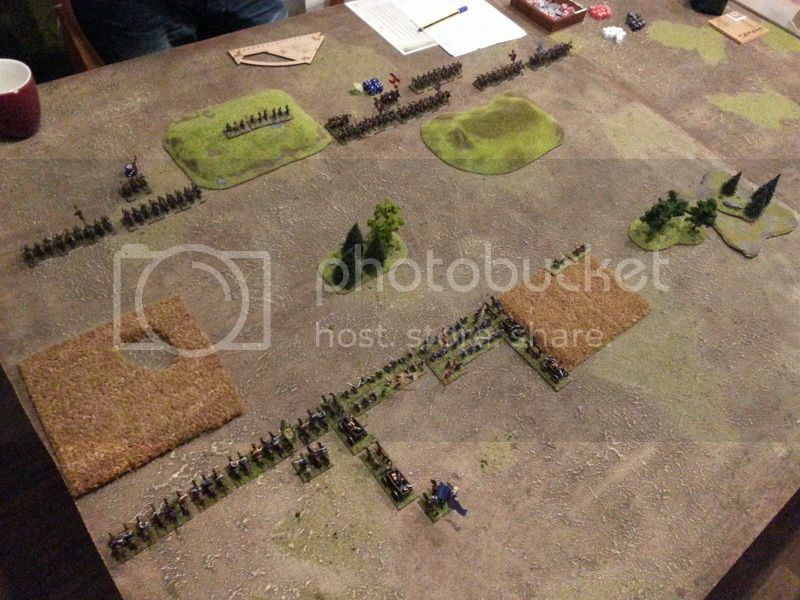 On the left flank there was some shooting with little effect between peasants and boatmen and dragoons. The boyar sons, having departed from their squadron, headed single mindedly towards the just found crossing in the river. -Well at least they are doing something right, told Krupin to his flag bearer while eyeing the mans backpack thirstily. But still there was no sighting of the second boat nor the cossacks. -Maybe they have wrecked their boat and drowned, Krupin smiled to himself. He tried to think positively. The Golova's laugh died on his lips. The other boatmen had arrived just in time to greet the boyar sons ON THE SAME SIDE OF THE RIVER! Krupin started to load his pistol sobbing. How did it come to this. The vodka was gone, the boyar sons arguing with each other, the peasants fleeing and the damned stupid boatmen failed to cross the river. Krupin left his command post on the bridge heading for the boyars and boatmen on the right flank. Someone is going to pay for this, he cursed while reaching for his other pistol. And then, when all hope seemed to be lost, his trembling hand didn't find his heavy pistol. It found something better. His personal spare bottle of the good stuff was tucked inside his pistol holster for worst case scenario. He had completely forgot the thing. The Golova shouted out load a terrifying roar of a war-cry filled with pure happiness. The boars took it as an order to charge the Lutheran peasant guarding the crossing. 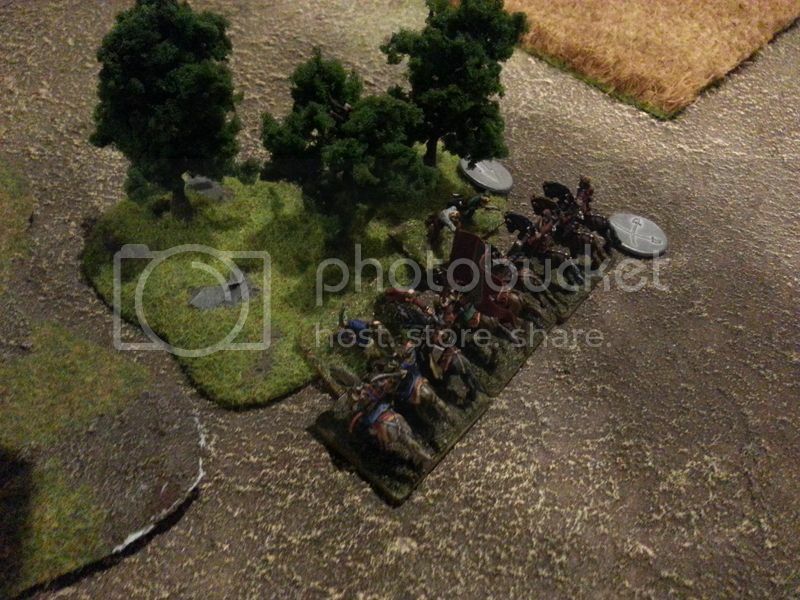 It was a close mach between two bases of peasant rabble and two bases of Muscovite noble rabb.. ..er.. shock cavalry. And due a single unsaved hit made against he peasants, the boyars sons won and killed the Finns when they were trying to flee! Maybe it was the garlic. At the same time things started to heat for the streltsy. 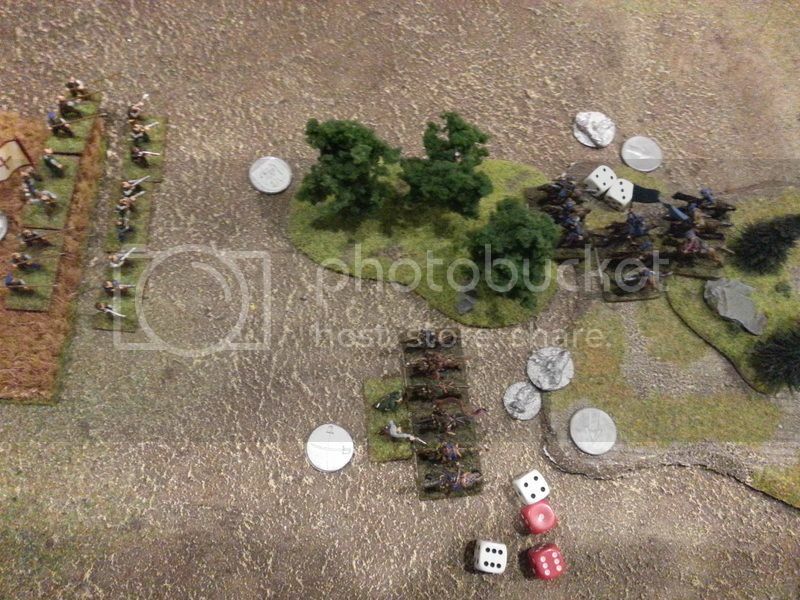 They were exposing their flank and rear to the musketeers and they couldn't turn, because the reiters had finally rallied and were preparing to charge the poor Muscovites. Perhaps they took the Golova's roar of joy as a command to hold their ground. And that is what they did. 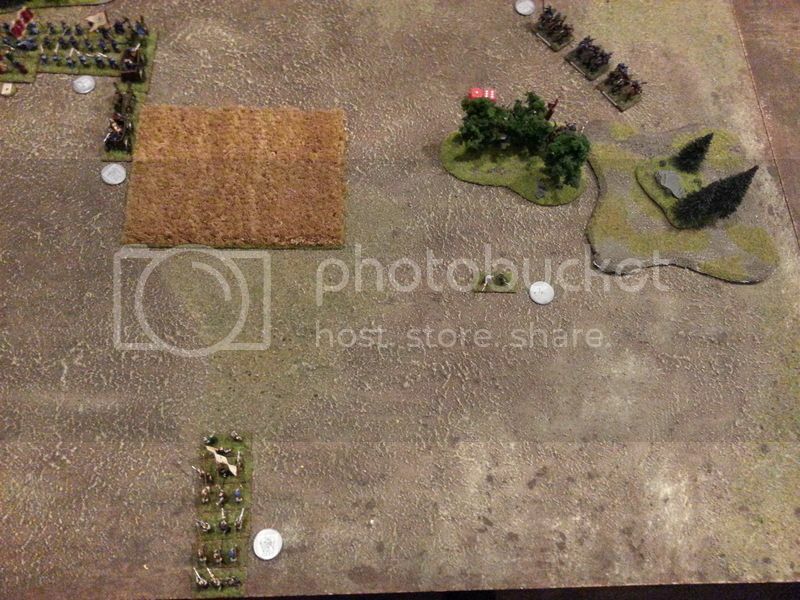 The streltsy managed to withdraw in good order and even repel the pursuing reiters under the fire from close range muskets. They were dying like flies, but their banner was held high and they didn't break. The last thing heard, by many dying streltsy, was the boasting of their commanding officer, Golova Alexei Krupin. -To the last drop! he shouted and emptied his reserve flask. So at the end of the fight there were several Muscovite troops still on the Finnish side of the bridge. The bridge it self was guarded by provincial soldats, who were quite happy to be on the other side as the streltsy. The flag of the remnants of once proud streltsy prikaz were still held high. The crossing was held by the boyar sons and cossack boatmen and Golova Alexei Krupin was completely hammered. When he came back to his senses on the next day or the day after, he was held as a hero. Who, against the odds, had outmaneuvered a more numerous enemy, and at the time of despair had raised his voice to encourage troops. Even more, he had managed to issue a charge order to the boyar sons and they had obeyed! The brave boyars had saved the day, by charging a rather sizable mob of Finland's finest and killed them all. There was a small side mention of some streltsy getting killed in a little skirmish near the bridge. Mt first strategic victory to the Muscovites! A group shot of the most unsuccessful boatmen ever. Heute gab's ein Spiel Haubi mit Litauen gegen meine Kosaken. Haubi stellten 14 FSP Litauer auf und ich 16FSP Kosaken,womit ich der Angreifer war. Haubi wählte "Delay the Enemy" als Senario. Meine Aufgabe war es Einheiten über die gegnerische Spielfeldkante zu bewegen und zwei Hügel einzunehmen, welche die Litauer besetzt hielten. Aufstellung. Die Litauer von Links nach Rechts: Elite Kosaken, Gepanzerte Elite-Reiter, Rotamaster. Auf dem Hügel abgesessene Dragoner. Banner des Hetmans (Elite Pancerni), Kosaken, dahinter der Colonel, Reiter, Elite-Kosaken und Tataren. Diebeiden letzteren bewegten sich noch mit einem Gewaltmarsch vorwärts. Bei den Kosaken von Lionks nach Rechts: Zwei Sotnien Berittene Kosaken, dann eine Rota Moloitsy und zwei zu einer Schwadron zusammengefasster Sotnien Registerkosaken (mit Esaul angeschlossen), flankiert von War Wagons. Dahinter der Colonel. Im Kornfeld befinden sich Skirmisher, welche sich mittels Gewaltmarsch noch ein Stück Richtung Wald schräg rechts bewegten. Unten Links der Kosaken Rabbel (nicht im Bild). Eine zweite Rota Moloitsy hat sich verspätet und betrat erst an Ende der ersten Runde das Feld. Der Kosaken Rabbel war zu sehr damit beschäftigt die Gegend auszuplündern, so dass sie nicht am vereinbarten Ort Aufstellung bezogen. Darüber hinaus herrschte eine solche Unordnung,dass sie das Gefecht ohne Befehl begannen. Sie verbrachten das ganze Gefecht über damit nach vorne zu kriechen und spielten keinerlei Rolle. Die Kosaken gewannen die Initiative und bewegten die Skirmisher vollends in den Wald, wo sie prompt von den Elite-Kosaken angegriffen werden. Nach zwei Nahkampfrunden verlieren beide Seiten ein Base, aber die Skirmisher verlieren die Nerven und fliehen, während die Elite-Kosaken erst einmal im Wald stecken bleiben. Auf der linken Flanke rücken die Kosaken vor. Durch Beschuss verliert die äußere Sotnia berittener Kosaken ein Base behält aber die Nerven. Die erste Runde ist vorbei und die verspätete Rota Moloitsy erscheint. Runde 3 (in Runde 2 ist nicht viel passiert). Die große Kosakenformation ist in das Wäldchen eingedrungen und dort mit Defence Order stehengeblieben, während die Wagen an den Flanken weiter vorgefahren sind. Die Elite-Reiter und Elite-Kosaken haben sich aus Respekt vor den Kartätschen der Wagen etwas zurück gezogen, dabei aber eine Lücke hinterlassen, welche die berittenen Kosaken ausnutzen um durch die gegnerische Linie zu schlüpfen. Das Banner des Hetmans macht sich bereit die Kosakenformation in der Mitte anzugreifen. (Anmerkung: Die Registerkosaken stehen in der gleichen Linie mit der Moloitsy Rota, der Wald ist aber zu dicht um die Modelle dort zu platzieren). Die Elite-Reiter machen sich ebenfalls bereit die Wagen anzugreifen. Auf der rechten Flanke haben sich die Skirmisher wieder gesammelt und rücken vor. Die verspätete Rota hat sich gefechtsbereit formiert und rückt ebenfalls vor. Die Elite-Kosaken dort haben leichte Verluste durch Beschuss der Skirmisher einstecken müssen. Die Tataren rücken vor, positionieren sich aber so,dass sie von der Rota nicht beschossen werden können. Das Banner des Hetmans (stehen eigentlich im Base-Kontakt, aber die Speere der Mloitsy verhindern das bei den Modellen) und die Elite-Reiter greifen an. Die Moloitsy und Registerkosaken schießen dem Banner des Hetmans ein Base weg, diese verlieren die Nerven und ziehen sich desorganisiert zurück. Dabei kommen sie aber nicht weit genug von den Wagen weg und fliehen in Panik. In Ihrer Flucht stürzen sie den litauischen Colonel in Panik welcher ebenfalls flieht und dabei die Dragoner mit in die Flucht schlägt. Alle (bis auf die Dragoner) konnten sich jedoch wieder sammeln. Der Angriff der Elite-Reiter prallt wirkungslos von den Wagen ab. Auf der Flanke vernichteten die Elite-Kosaken eine Sotnia berittene Kosaken und schossen der anderen ein Base weg. Diese bewegt sich in vollem Galopp in Richtung Spielfeldkante. Die Litauer umkreisen sie so gut es geht um sie noch in die Flucht zu schießen. Die berittenen Kosaken entkommen verfolgt von einem starken, aber wirkungslosen Kugelhagel. Die Dragoner sammeln sich wieder. Auf der rechten Flanke greifen die Skirmisher die Elite-Kosaken an. Die Litauer ziehen sich zurück wohl wissend dass die Kosaken nicht mehr in nennenswerter Zahl den Hügelerreichen können. Um den Beschuss der Kartätschen zu entgehen drängeln sie sich alle hinter dem Hügel. Die Wagen fächern auf um doch noch Schaden anrichten zu können. Eine fliehende Einheit würde immensen Chaos anrichten...doch leider ist der Beschuss wirkungslos. Ergebnis: 4:3 für die Litauer. Ein Unentschieden! Im Nachhinein hätte ich die ganze Armee (bis auf die berittenen Kosaken) weiter nach rechts aufstellen sollen um den vorderen Hügel anzugreifen. Aber ich war besorgt, dass der dortige Wald meine Wagen zu sehr ausbremsen würde. Somit waren die Kosaken dann letztendlich zu langsam. lustiger BR oben. "verlieren die nerven", hehe. wie habt ihr denn 14 vs 16 gebaut? geben die normalen skirmishlisten das her?